Here at Flicks And The City, we’re huge fans of seeing all the Cosplay efforts at conventions around the country. From the traditional Doctor Who and Star Trek that have been around for decades to the hugely popular Game Of Thrones in more recent times, Cosplay gets bigger and better with every passing year. Over the next few months, we’ll be talking to some of the most recognisable faces on the UK Cosplay scene to find out about their inspirations, how Cosplay has changed their lives, and what future projects they have up their sleeves. Our first victim interviewee is Lisa Marie who is known across many different fandoms, from Harry Potter to the Marvel franchise and beyond. 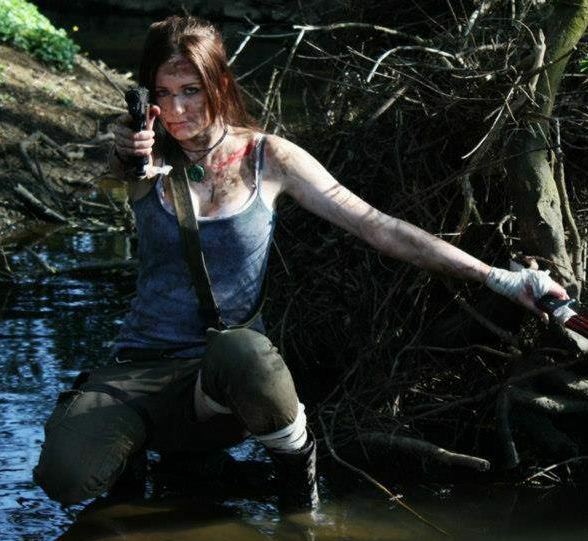 As one of the recent ‘Cosplay Stars’ at a London Film and Comic Con event, Lisa Marie had the opportunity to share her knowledge of spending far too many frustrating hours making her own costume pieces, and provided valuable insight to those aspiring Cosplayers attending various panels over the weekend. We recently had the chance to talk to everyone’s favourite female Hawkeye to learn more about her craft and how her work has developed over the years. What was the first convention you ever attended? It was actually the first Eternal Twilight run by Showmasters in 2009. I know! What can I say? I was a teenager and I liked Twilight as did pretty much every 16/17 year old who could read at the time. Haha! After that, the first multi-fandom event I attended was London Film and Comic Con that year. How did you initially get interested in Cosplay? When I made my first attempt at LFCC 2010, I had been attending conventions for almost 18 months. When I originally attended my first LFCC I saw the amazing costumes that people were wearing and it was such an inspiration. 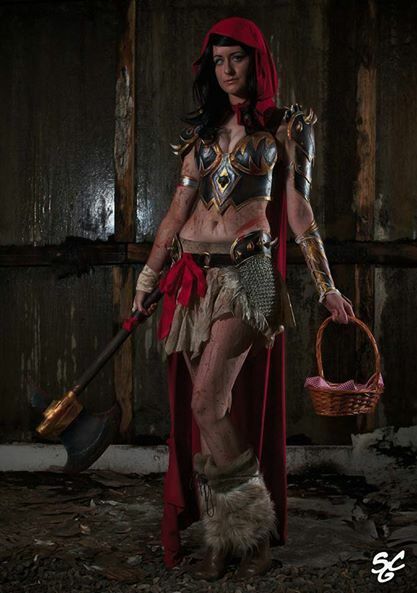 I remember seeing FairyPorchQueen (Emmy) looking amazing dressed as Wonder Woman and having my eyes opened to the world of Cosplay and the sheer scope it allows. You can make costumes from absolutely anything, including your own imagination, and that was what drew me to the hobby initially. I threw together my first Cosplay for LFCC 2010 (Amy Pond) from clothes in my wardrobe and a jacket I borrowed from a ‘normal’ friend, and the reception I got was such a shock. It was addictive, and that’s why I’m still doing it today. What was the first Cosplay you ever created all by yourself? I think it was the armour that Amy Pond wears in The Girl Who Waited. When I took on that project it was wholly ambitious for someone who had never made a costume before, and I started the project the day after the episode aired. I’d made parts of costumes before that – my Amy Pond kissogram jacket for example – but an armour build was completely new. To be honest I have no idea how I managed it! I tackled it the same way I still do with every new costume: throw yourself in and if you make a mistake, it doesn’t matter, try again. It took 3 weeks of hard graft and was a huge learning curve but I still have it in my wardrobe signed by Karen Gillan. Do you have a favourite out of all the ones you have done? That’s like asking to choose a favourite child! But it has to be Hawkeye. That costume is like my baby. So much hard work, planning and re-drafts went into creating my gender-swapped Hawkeye, and it posed its own challenge in adapting a male costume for a female body without compromising the integrity of the costume itself. Unlike most Cosplays where I copy the reference material as exactly as possible, Hawkeye posed the problem of working out how I could change the design to work for my body, but also keep it as close to the original as possible still. It’s a bit of a paradox really! You seem to be into many different fandoms. Does that help your creativity? I really think it does. I am such a fangirl, and it helps to have a lot of fandoms to choose from when picking costumes! I’m passionate about so many areas of nerd culture that it gives me a wide scope to make costumes varying from Disney Princess ballgowns to spandex-wearing superheroes and gun-wielding action heroines. But it’s also a bad thing in such that every time I watch/read something new I’m sat there thinking “I want to Cosplay that”… but there is not enough time in the day! There is this unfortunate belief that girls in costumes tend to be doing it for attention rather than love of the character, but for almost everyone I know that is completely not the case. Why would we put all the time and effort into something we didn’t like? I am reaching the point in my Cosplaying where I’ve done around 40 costumes and I am broadening my horizons to characters I may not be 100% familiar with, but that shouldn’t be a bad thing. As I have Cosplayed dozens of characters I am completely obsessed with already, I can’t be completely attached to every character I do anymore, but some kind of connection is still really important to me. If you could give any advice to a first-time Cosplayer, what would it be? Cosplay is the best thing you will ever get into! Do it, and don’t be afraid. Cosplay can be expensive, but it can also be accessible to everyone regardless of age, race, budget or background. If you can’t sew? Start by modifying clothes and crafting with cardboard – that’s what I did! I couldn’t sew a straight stitch 4 years ago, but I’ve taught myself, and it’s such a rewarding hobby. Also: use Cosplay as an icebreaker. If you are at a convention in Cosplay and you see someone else Cosplaying from the same series as you, or a series you love, that is SUCH a perfect way to start a conversation and a potential friendship. We are all nerds in costumes at the end of the day, the vast majority of Cosplayers are very friendly people! Your creations now are a lot more complex than when you first started. On average, how long does a complete project take? It ranges drastically dependent on the project and my deadline! I’ve knocked out costumes in a few hours (such as Elektra, Alex Weiss or Lara Croft) but some have taken me up to 6 weeks (like Little Red Riding Hood or Hawkeye). Deadline can be a huge motivator; I made Princess Aurora as a spur of the moment decision and sewed the dress from scratch, with no pattern, in 2 days. That I do not recommend! I also have at least 4 Cosplays that have been sat unfinished for over a year. Unfortunately, real life gets in the way sometimes. I have to mention Channel 4’s TV show Geeks which you appeared on. What was that like as an experience? It was an experience, for sure! The show I was on was not the show I signed a contract for, let’s put it that way. Lies and deception I realise now are all part of being in TV. The filming was stressful but it also made me bond with Stacey and Esti so much, which was wonderful. They did not attempt to belittle our hobby or show us in a negative light which was great, and pretty much the only thing that matched what we had been told about the show before was that we were flown out to Vegas. I am glad I had the experience, being in front of a TV crew is absolutely nothing like I would have expected and I have a new found respect for people that do that as their life! The hours upon hours of waiting around, the forced conversation, the set-up situations which you have to act ‘natural’ in, even when they’re being re-shot for the sixth time? Nope, not for me! You had the chance to be a ‘Cosplay Star’ at a convention, giving panels and meetings fans. Was that a little surreal? It was at first, yes, but I realised that the questions I was being asked during panels were questions I had answered one-on-one dozens of times, just in front of an audience. And meeting ‘fans’ (I use the term for want of a better word!) is just like meeting anyone else, except they know your name and a little about you from following your internet presence. It’s hard to explain. The hardest/oddest thing I find is being at a convention, especially as a ‘star’, and having people chatting to me using my name and I have never met them before so don’t know who they are. THAT is surreal. I always, always without fail spend the first few minutes wondering if I know the person I am chatting to and wondering if I should know their name as well. That’s weird. Can you give us any hints as to what future projects you have in the pipeline? Sure. I’m working on a few more superheroes; Black Canary from CW’s Arrow and Emma Frost (Phoenix Force) being a few of them, and I WILL get Sansa Stark finished soon. That is one of those costumes I mentioned that has been on hold for far too long. I’m itching to do a big armour build, but I can’t decide exactly what and that’s driving me mad! I much prefer crafting over sewing, but my upcoming costumes are very sewing-based and that’s kinda scary. Haha! I’m also really, really tempted by Elsa from Frozen as I only watched the film a few weeks ago. Photography credit: Red Riding Hood (Super Cosplay Girls), Hawkeye and Lara (MCP Cosplay Photography), Zatanna (Kurnikoff). Huge thanks to Lisa Marie for her time! You can find her on Facebook at http://facebook.com/lisamariecosplay for more photos of a variety of Cosplays!